This is a repeat of the photos I put on Facebook, so if we are Facebook friends you have already seen these....so read on if you haven't or if you want to look at them again...they are that good! If you get a chance to go to Oxford, MS please make time to go by the University Museum. The show will be there until April 16. The quilting really helped give dimension to the dancers' bodies. This was her first quilt, made from drapery samples. This was made from a photo of crop circles and an article about them that said they represent the first ten digits of pi. You can see some of the digits in the next photo. A number of my friends from the Columbus Guild, Possum Town Quilters, came. Here is Julia Graber She is an outstanding quilter too...she has won several national awards. This is probably one of her most famous works, but the metallic thread made a good photo difficult. Caryl dies a lot of her own fabrics in order to get the gradations she is looking for. Notice that the quilting is amazing and free hand done...no programmed machines. This is done with pleats. Wish I had taken a close up of it. You know I always love this kind of design. Check out my friend Naomi's pics...Click here. It is interesting to see what she took. 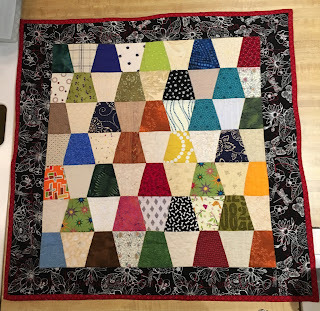 I love all the close-ups of the quilting that she took. Naomi also had a link to Caryl's web page. To see professional quality photos of Caryl's work Click here. I loved the exhibit, I will have to try to do some more art quilts! I had two small finishes this week...well they are all finished except writing out the label. I finished another one of the small tops that I was practicing a quilting technique I saw on the craftsy class by Jacquie Gering. Still need a name for this one. I used the Bernina to do a serpentine stitch in horizontal rows. The second finish was my MQA challenge. I had already cut a bunch of tumblers in various sizes to do Bonnie Hunter's leader ender for this year. So I used them and made my 25 by 25 inch quilt to meet that challenge. 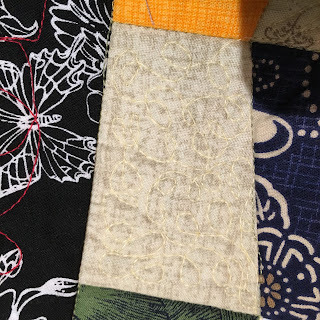 I have also been taking the Leah Day free motion class from Craftsy so I did a different free motion quilting design on each of the neutral tumblers. I believe I am going to call this "Thimbles". Working on binding the antique top and quilting the scrappy mountains. I decided to quilt it to kind of look like a topographical map. So that meant walking foot work across the quilt. I am having some issues with rippling...maybe the tension is too much on the presser foot. Not sure. Maybe a good pressing when done will take care of it. We will see. Got to get ready for Sunday School now. I have been working on lots of different things but don't seem to have much in a place to photograph. I have been working on quilting a 25 x 25 inch quilt for a challenge that Julia Graber our incoming Mississippi Quilt President has issued. But I am not done. 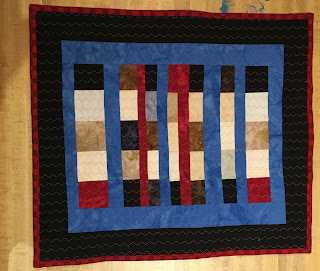 I also worked on another small quilt that I did to practice my straight line quilting techniques, but I have not finished the binding on that yet. 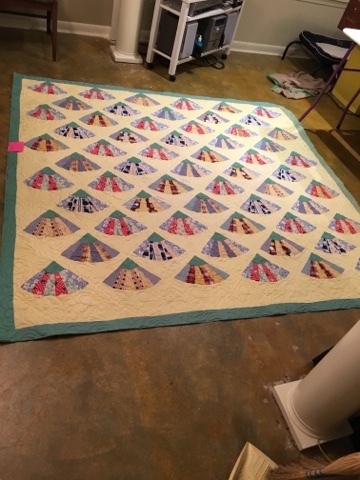 I did pick up an antique quilt top from Betty Lewis, a long-armer, in Louisville, MS. She did a great job, and even appliquéd a piece in to fix a hole in one block! If you look closely, you can see a pin marking a small hole. See how many of the fans are billowing? Trimming always makes me go WOW...it makes such a difference. I have sewn the binding on with the machine, but have not sewn it down either. But here is a picture of it without the binding. This quilt top was given to my brother by one of our second cousins that said he was told our Great grandmother, Connie Frances Billingsley, made the top. It may be made by her, as it has lots of her favorite colors in it. I am not sure she did, as it does not seem to be the quality of some of the other tops she made. It did not lay flat at all and Betty did a great job quilting it without getting any pleats! She had me bring extra loft batting and said she would hit the popped up places with a steam arm and quickly quilt it up to avoid pleats!!! I am naming this one "Summer Breeze" as the colors look summery and there are dresden fans on it. I will try to have some things camera ready for next week. 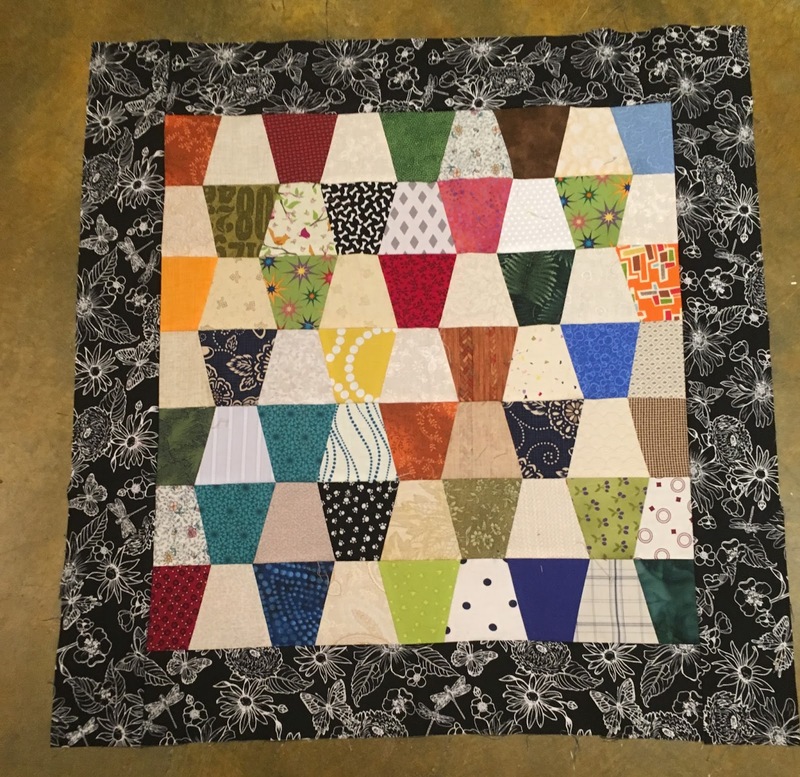 Julia Graber, incoming Mississippi Quilt Association (MQA), issued a challenge to make a 25 x 25 in quilt for our 25th Anniversary. I had some tumblers cut out so I made that up into a quilt top. Once I get it quilted, I will trim the borders to make the quilt 25 x 25. That will make them different widths on the top / bottom and sides, but that will be OK. Here is a link to Bonnie Hunter's page about tumblers. I also got the borders on a scrappy mountain quilt I have been working on after a long search for my tape measure. It was right where it was supposed to be, but I just wasn't seeing it. Don't you hate that? Here are two different shots of it. This is another free Bonnie Hunter pattern. Click here to link to the page. I have two of the Allietare quilt blocks, but when I was working on them I was having a dyslexic day and had to rip the star block apart twice!! So it is going to have to wait till I am not tired. 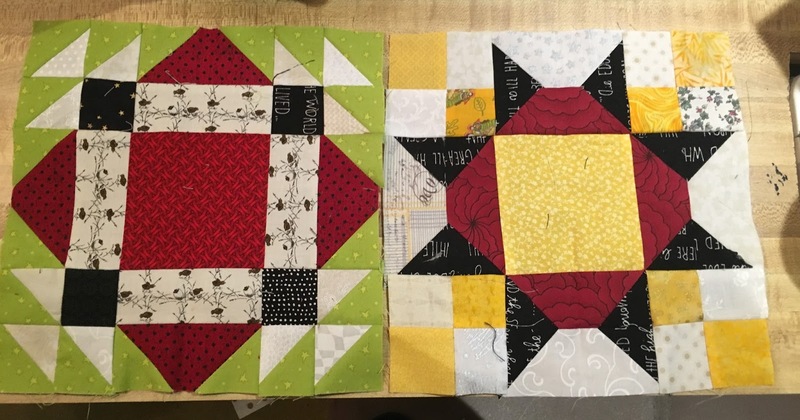 Here are my two blocks! I am excited to get back to that! Time to get ready for work! I have finally finished all the parts to the Winter Bonnie Hunter Mystery, but I don't have any blocks put together yet. I have also just completed a minor improvement to my sewing table. I have had problems when sewing a bigger item like drapes that it catches other tools on the table and pushes them over the edge. In addition, I have been taking an online class by Leah Day on Craftsy on free motion quilting on your home machine. She was saying your sewing table should be up against a wall to keep the quilt from falling off the edge of the table and jerking on the needle. I have just finished setting up my sewing room this summer, and did not want to rearrange, so I came up with an idea to stop that without moving my furniture around. I bought a 1 x 10 board and made a small "wall" for the table. I drilled a hole in the center of the board about an inch and a half from the edge and through the lip of the formica table, put a bolt and wing nut through. Then I leveled the board and drilled a hole on each end and put bolts through those holes. Then I took the board off, using the same center hole put the board on with the larger part up. then I drilled two more holes for securing the board when in that position. 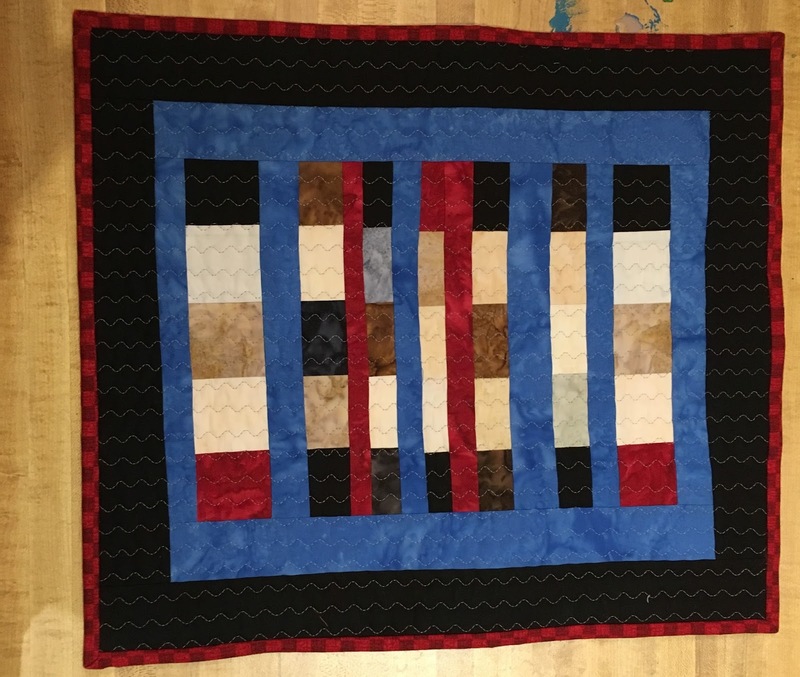 This forms the "wall" when free motion quilting. Craftsy 2012 Block of the Month quilt finished! I finished a quilt that I have wanted to finish for quite some time. It was the craftsy block of the month quilt I made for my bedroom. My mother, Rebecca Turnage, was an artist, an art teacher, wife, mother, and fun lady. She did a series of paintings using paper towels and watercolors. I have hung a bunch of these in my bed room. Several years ago, I was the president of the Possum Town Quilters. Boy that seems to be a life time ago. 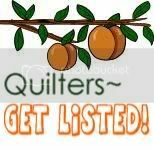 Well part of our goals was to mentor new quilters. 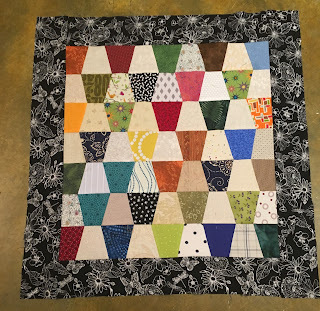 I thought the craftsy block of the month quilt class by Amy Gibson would be a great place to start. They would do lots of different blocks and see lots of techniques. Of course I did the blocks too. Well when the year was up, (a year in which I changed jobs and moved) I wanted the quilt to be a bit bigger, and there were a couple of blocks I wanted to change out, so I set the project aside. I was in the midst of a renovation and was teaching calculus for the first time. Anyway this year, I finally got my sewing area set up and it has been such a blessing. I love coming in here in the evening and usually accomplish something almost every day. I used this painting as my inspiration for the colors. I designed the center block to reflect this painting. By the way it was quilted by Betty Lewis of Louisville, MS. Here it is on my bed, don't you think it brightens up the room? This makes we want to start the upholstery project...I have a chair I am planning to do in burnt orange. To go in my bedroom. I also want to redo the pad on the chest at the foot of the bed.